Evergreen Backcountry Guides (EBG) is a branch of Evergreen Outdoor Center in Hakuba offering Hakuba Powder tours and a lot more. Evergreen is an incredible company, delivering amazing outdoor experiences to clients from across the globe. Following the Evergreen Outdoor Center Website redesign by Flick Digital in 2015 to get the company’s website mobile, the plan to develop new, uniquely branded sites in 2016 for their different services went into full gear. EBG’s new website was the first stage of this. This part of the business ing- operat Backcountry Tours, Snowshoe Tours, Cross Country Tours and Avalanche Training – was rebranded and a new site built specifically to showcase these services. Once the site was live, the original EOC site was updated so that all links would redirect to the new pages. The site was built using similar elements as the original site (top bar, menu, layout and fonts) using Evergreen’s brand colors throughout. Images were chosen to best reflect what clients would experience, and to put the potential client’s “in the boots” – to give them a feel for what they’d experience, provide them enough (but not too much) info, and to get them pumped to go out touring with the guides. 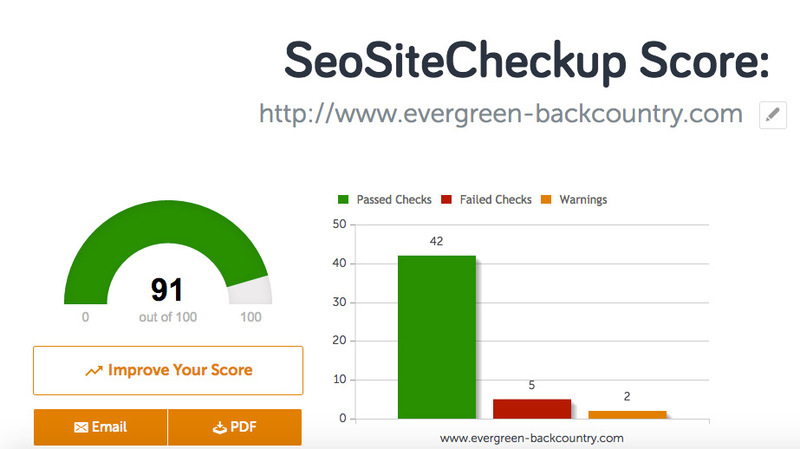 I performed keyword research and used semantic search terms throughout the pages in order to give Evergreen the best chance to gain ranking and receive organic traffic over time. As is the Flick Digital way, the client was given full access to view the site being developed live and was able to give crucial input along the way. This helps us create something completely in line with the client’s vision and avoids multiple design revisions in the end stage. As with all Flick Digital sites, Evergreen Backcountry Guides has been built using X-Theme and the Cornerstone Visual Editor. This gives an incredibly simple way to edit and add content to the site which is appreciated by all my clients. And of course it is completely responsive, mobile friendly, optimized to load quickly, and built to pass the majority of technical SEO checks. The first step to building a website that ranks and converts is to have great content, clean code and strong SEO fundamentals. Great design and content is a given. What follows is a quick rundown of how the site stacks up technically. In terms of speed optimization, you can read more about exactly what was done in the Site Speed Optimisation post here. With regards to the technical build of the site from an SEO perspective, the site ticks nearly all boxes. It loses some marks for not having HTTPS, and it fails the canonicalization test due to being hosted on a CDN and the tool not reading that, but all said and done the result is pretty good. That’s it! Prior to going live the site was tested by a bunch of people, heat maps were added so we could see how users were responding and make tweaks where necessary, analytics were setup, and the site was sent out into the world to get people stoked to visit Hakuba and get on a tour with Evergreen. I lived in Hakuba for nearly 10 years, my wife is from there, and I absolutely love the place. If you like Japan powder skiing I highly recommend you make a trip to Hakuba. And when you make the trip happen, check these guys out. Flick me through your details and let’s see if we make a good team.